The 11 national screening programmes cover a wide variety of conditions, age ranges and screening tests. However, 1 thing they all have in common is that GPs and primary care are involved to some extent. It’s important we keep GPs informed, whether it’s about encouraging partner testing in antenatal sickle cell and thalassaemia screening or supporting informed choice in abdominal aortic aneurysm screening. I'm Jim McMorran, a GP in a busy urban practice in Coventry and have been involved in helping bring a primary care perspective to developments in the screening programmes. Via my role as Editor for GPnotebook, I know how challenging it is to keep up to date with clinical guidance and developments when the everyday work pressures in primary care are so great. In light of this, and working with the NHS Screening Programmes, I am writing a series of blog posts to help update my fellow GPs on the most important screening issues relating to primary care, starting with the NHS Cervical Screening Programme. GPs, practice staff and laboratories should not contact the PHE Screening helpdesk with any of the above queries. Members of the public should not contact PCSE directly. Patients should contact their GP if they have any questions. Here’s a reminder of some of the most common patient queries about cervical screening. Can I have my screening result? When is my next test due? The woman’s patient record will have the date and results from her most recent test. Women aged 25 to 49 are invited for cervical screening every 3 years. Women aged 50 to 64 are invited every 5 years. If you can’t access their record then you should contact the national PCSE helpline. Can I be screened without an invitation letter? Yes. Provided a woman is due for her test then she can be screened, whether or not she has an invitation letter. It will be clear from her medical record if her cervical screening test is due or not. Can I have a cervical screening appointment? Yes, provided the woman is due for her test. Women should call their GP practice for an appointment. If they aren’t registered with a GP, they should look up details for their local NHS walk-in centre and/or genitourinary medicine (GUM) clinic and ask if they offer screening. Registering with a GP is the best guarantee to access the service. The NHS Cervical Screening Programme recently introduced new invitation and result letters. It also introduced new information leaflets for women invited to screening, and for women who are referred for colposcopy following an abnormal screening result. The new invitation letter makes it clear that attending screening is an individual choice. It also has space for the GP practice to enter information about female sample takers, clinic times or practice details. 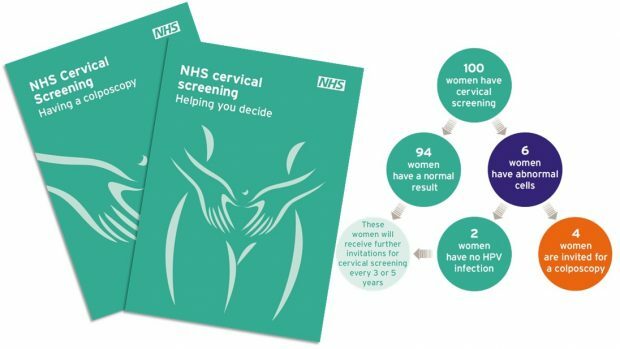 The new result letters contain result-specific information, so the old leaflet, Cervical screening – what your abnormal result means, is no longer needed. Result letters about non-cervical abnormalities have changed. They advise women to make an appointment to see their GP for a referral to a gynaecologist as soon as possible. I look forward to blogging again soon about another screening issue and the involvement of GPs and primary care. Watch this space. You have said that "The new invitation letter makes it clear that attending screening is an individual choice", however, I am experiencing difficulty in exercising my right to choose. I received an invite for screening last February and immediately wrote to the screening service, copy to GP, to opt out (as per the PHE guidance). However, I received a second invite in August. I wrote again to my GP to state that I have made an 'informed decision' not to undertake screening and to request that my data is not shared with screening services in the future. PHE's guidance on data collection and confidentiality states: "PHE has appropriate safeguards in place to ensure the security and confidentiality of the data it uses. Individuals who choose to opt out from their data being accessed by PHE will not be invited to screening in the future." I have, within the last couple of weeks, received my third invitation for screening, so clearly my requests are being ignored. Please do contact the screening helpdesk using our contact form to let us know if you have further problems opting out. Keep up the good work- but give us proper info!! Thank you for your comment. Information will be provided to women when invited for cervical screening with an explanation on the HPV virus, HPV testing and what this means. We understand your concerns regarding providing information on the actual risk. High risk HPV is a necessary but insufficient cause of cervical cancer and is found in 99.7% of cervical cancer cases. The risk in terms of a percentage of women developing cancer within 5 years of a primary HPV negative screening test result is close to zero, but this will vary according to the individuals vaccination status, age, smoking status and previous screening history. Detailed sample taker training will be made available via e-learning prior to the national roll out of HPV primary screening to ensure sample takers have this information available. Further information on HPV is currently available in our new Sample taker e-learning module. Thanks for the reply. I understand the HPV testing programme is currently being rolled out. This means a probable long delay before self testing is even considered. The Dutch are happy to allow it's women to self test. Surely if cervical cancer is as big a threat as women are led to believe. ..anything that might help save lives like self testing should be rushed through?? Scare campaigns aren't working. . Thank you for sharing your opinions. The NHS Cervical Screening Programme is currently considering self-testing options which will become a possibility once HPV primary screening has been implemented. Cervical screening intends to detect abnormalities within the cervix that could, if undetected and untreated, develop into cervical cancer. The incidence of cervical cancer has decreased significantly since the introduction of the cervical screening programme. Screening is estimated to save 5,000 lives per year, further information can be evidenced in the research undertaken by <a href="https://www.ncbi.nlm.nih.gov/pubmed/15262102">Peto et al: the cervical cancer epidemic that screening has prevent in the UK</a>. In 2015 to 2016 the screening programme detected more than 30,000 cases of high grade abnormalities. To find out more on the results of the programme please see the <a href="https://www.gov.uk/government/statistics/cervical-screening-programme-2015-to-2016">statistical report that details the latest results for 2015 to 2016</a>. "However, these estimates are subject to substantial speculation..."
Cervical cancer is a rare cancer and no other Western country, (including those with much lower screening rates than our own) is experiencing anything like an epidemic of this disease, which was already in steady decline since the 1950s, well before screening began. £175,000,000 of public money is being spent annually on a programme based on substantial speculation, and it is time the public was told the truth. Thank you for sharing your views. Cervical cancer is the 13th most common cancer in the UK. Incidence of cervical cancer fell sharply following the establishment of the NHS Cervical Screening Programme in 1988. It is not possible to have evidence of a situation which does not exist (what the incidence of cervical cancer would be in England in the absence of screening). However, it is possible to estimate, using incidence trends over many years, what it may have been like. Recent research suggests that screening between 1988 and 2007 has prevented 35% of expected cases (Franceschi et al Cancer Epi 2015). Further, there is evidence that the risk of having HPV has increased over the years meaning that women currently aged 25 to 45 are at particularly high risk of developing cervical cancer. Complementary research, which has used the reduction in risk of being diagnosed with cervical cancer following cervical screening, concluded that screening prevents 70% of cervical cancer deaths in England (Landy et al BJC 2016) and that this could be increased to 83% if everyone attended when invited. We continue to offer women a high quality screening programme to achieve our aim of reducing the number of women who develop invasive cervical cancer and the number of women who die from it. The NHS is always quoting that the cervical screening programme saves approximately 5,000 lives per year, but the actual incidence of cervical cancer is only 2,300 cases per year, about half of which are said to be non-attenders reporting with symptoms. That only leaves about 1,150 cases which have been picked up by this programme. Can you provide evidence for this figure of 5,000, please? Cervical screening is intended to detect abnormalities within the cervix that could, if undetected and untreated, develop into cervical cancer. The incidence of cervical cancer has decreased significantly since the introduction of the cervical screening programme. In 2014 to 2015 the screening programme detected more than 31,000 cases of high grade abnormalities, more than 1,200 cases of glandular neoplasia and more than 600 cases with invasive carcinoma. To find out more, please see the statistical report for the programme that details the latest results here: https://www.gov.uk/government/statistics/cervical-screening-programme-statistics-for-2014-to-2015.